is he a christian, a muslim, or a cactus? why can’t we just believe president obama? I received a letter this week from the White House. A big fat packet. Ain’t I special? Unfortunately, it wasn’t an invitation to a special Gala or for me to sing at an event. It wasn’t about a partnership with One Day’s Wages. Or to join his circle of sagacious advisors. Or to ask me to join Warren Buffet in helping turn around the U.S. economy. Or to inform me that he’d be visiting my church. And no, it wasn’t a direct letter from President Obama himself. 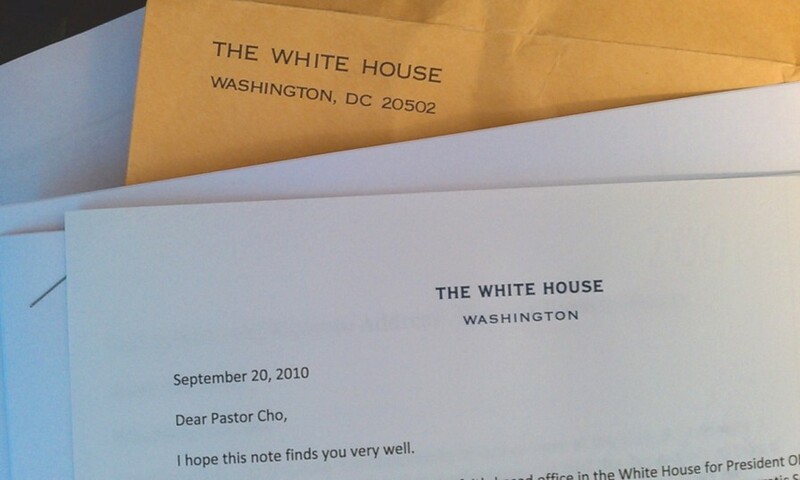 But it was a letter from one of his staff sharing some stuff about President Obama, some initiatives, and what I perceived to be clarity about his faith. Huh? It puzzled me initially but after some thought, I think I know why I received the letter as I’m sure several other “pastors” may have received it as well. The purpose of the post has nothing to do with juxtaposing the two religions in question: Christianity and Islam [or Cactusism if you want to count that]. Why can’t people just believe him? It’s amazing to me that if someone doesn’t share one’s exact worldview, how easy it is to discount the genuineness and veracity of that person’s statements and identity. I have – on occasion – been labeled and called numerous things including heretic, non-believer, “not a true Christian”, and a jerk and with the exception of maybe “a jerk,” none of them are accurate. Being called such things or questioned of something so dear to me (my faith) definitely does not feel good. It actually stings…a lot. I recently I read an article about President Obama being asked at an event “billed as a discussion on the economy” about his Christian faith [and views on abortion]. While I may have answered the question with different words and nuance, I was impressed with his answer in the same way that I was impressed with former President George Bush [Jr.] when he spoke about his faith. “I am a Christian by choice,” Obama began, standing beneath a blazing sun, when asked why he is a Christian. His faith is a personal choice and a personal decision and he has made it very clear what his choice and decision is. His view might not exactly mirror my view or your views but he is a Christian. He believes in Jesus. He believes in the Gospel. Personally, while I very much like the idea that he is a Christian and believes in Jesus, I care more about how he leads this country and influences the world as President of the most “powerful” nation in the world. So, while I enjoy receiving thick packets from the White House because it makes me feel important and that I get to see direct outputs of my tax dollars, I’d rather have President Obama and his administration tend to more important things: Immigration, Foreign Policy & Relations, the Federal Budget Deficit, the Economy, Health Care, the Education System, moderating the excessive militarism and presence of US soldiers on foreign soil including the war in Afghanistan and Iraq, caring for our US veterans, unemployment, the alarming and rising rate of poverty in the US, extreme poverty, the Global Fund, the environment, and terrorism – just to name couple minor issues. Rather than further prognostication on his cactus-icity, let’s pray for him, uphold him and the rest of the government in accountability, and work with one another and the larger society to work towards common goals that benefit all. *Cough* and abortion… to say the least. thanks for sharing Eugene, being overseas we don’t get this kind of info from our news sources. bummer that you didn’t hear that he might be a cactus. I believe him, but I’m soooo glad you wrote this. I hope everyone in this thread asks the same question to 10 people. Thanks eug. I see no fruits of the Sprit in Mr. Obama. He lies, he cheats and you should call him out. Christians don’t do that. I don’t see that his views fit in with orthodox Christianity. God is the ultimate judge. My problem with this situation is not that people like Adrienne complain about Obama, but that they didn’t give similar time and effort contemplating Bush or Reagan or Nixon or Ford. Obama is not as orthodox as I would like. But I think he is more orthodox than many past presidents. The problem is that many Christians are using orthodoxy as a proxy for political beliefs. If you problem is that he is a democrat then say that. But if you problem is that he is not orthodox enough for you, then be honest and say that very few other presidents have been either. and so are you apparently. He loves his family; he’s faithful to his wife. He’s done good works in service to his own community. These things are not fruits of the Spirit? My view is that he’s just like any other politician and thus makes many of the same distortions of the truth; but not since Kennedy has any other politician’s professions of faith been subject to so much doubt and malicious gossip (the latter of which St Paul expressly condemned). @PE: Thanks for this post. I’d completely agree that sending out large packets of “proof” of someone’s spiritual status to who-knows-how-many people is not a good use of our money. @Adrienne: The Bible has a couple responses to your comment. Good stuff. We already had a cactus for President. His name was George Bush. He was just prickly and dry and only another cactus would want to be around him. I like that President Obama is a Christian as well. Also, I wouldn’t care if he was Muslim. This is America the last time I checked. Land of the free, home of the brave, freedom of choice. I am certain I read that somewhere. All the bigots need to shut up. I just have to wonder. When did somebody believing President Obama is Muslim become a slur? And why are those referred to as “bigots” like SA calls them? We’re constantly being told the Muslim faith is a “religion of peace” and how wonderful it is, but it’s an insult when somebody thinks Obama is Muslim? There are quite a few reasons why people may think he’s Muslim. Saying it’s merely because of bigotry is absurd. Mainly, because there have also been convincing evidence that believing President Obama is Muslim is linked with his approval ratings. Ie: if you don’t like him as a president, you’re more likely to also say he is Muslim. And going along with that, the perception of Muslim being linked with “terrorist” has been increasing, and people are also rating Muslim neighbors as being less and less desirable. Those things make it fairly clear, to me at least, that being Muslim is societally considered to be a negative thing. Whether an individual feels the same way isn’t the same issue as whether it is, culturally, a negative or a positive. We all practice our faith in different ways as we have different gifts. Just because he’s quiet doesn’t mean he doesn’t practice. Thanks for the post. I agree that we have more important things to worry about. I think you didn’t really answer the question in the title of the post, though. It sounds like you think the answer is that the primary reason folks don’t believe the president in this instance is that he holds a different world view than they. He’s made a habit of saying one thing to the public, and then doing something else. I don’t know what he’s thinking, and I’m certainly not privy to what goes on behind the scenes, but it makes him look dishonest. Couple that behavioral pattern with a media blitz to convince “pastors” (as you put it) that his faith is sincere, and it becomes harder to believe. I truly hope that the president is sincere in his statements re: his faith, and I pray for him often. But, the proof is in the pudding, and because he has established a record of speaking from both sides of his mouth, everything he says is suspect. If President Obama said what he meant, and did what he said, we wouldn’t be having this discussion. Not bad, compared to most politicians? And how is that different than the rest of them, who NEVER had to deal with this kind of doubt regarding their faith or sincerity of their personal beliefs? That’s good information. Thanks for sharing. By the numbers alone, it does look like he’s done a good job keeping his promises. And, I certainly recognize that facts on the ground can change things in such a way as to make it undesirable to keep this or that promise. But my purpose was to answer the question, “Why can’t we just believe President Obama?” For me, the answer is, “because I believe he’s demonstrated that he’s not trustworthy.” I’m sure that I’m not alone in that view. And it’s immaterial whether the view is based in fact or misinformation (or ignorance). The perception colors our view of things the president says and does, for good or ill. So I am assuming from that answer that there is NO president that you would believe? Since they all have been politicians, and have all lied, and have all “demonstrated that they’re not trustworthy”. And yet, somehow our current president is being doubted beyond what any previous president has encountered, and is having to combat those doubts about his faith in order to simply do his job? I guess the purpose of the question is more than just to determine what you personally think, but rather to look at why, as a societal trend, this president is having his faith attacked so vehemently. And why 20% of us are inclined to believe it even with evidence to the contrary. And I utterly disagree with you that it is “immaterial” whether a person’s view of the president is based on fact or fiction. Ignorance may explain why a person believes a professing christian president to be a cactus, but there is not a possible universe where ignorance justifies that belief. Personally, I don’t think that the President has said one thing in public, then done something else. The truth of it is that all politicians speak of what they want to do, what they will try to do, but that they are not often powerful enough to just “do” it like many people want him/her to, or fear that he/she will. They can work towards what they want to do, but it is more complicated than just “do” it. The nature of our government is such that a President cannot just do whatever he wants, he must get Congress and the Courts to follow along as well, an extremely complicated task. Any bill that the President endorses will have to be bi-partisan enough to make it through Congress, and will have to be legal enough to make it through any lawsuits against it in the Supreme Court. There are many things that I think Obama has wanted to do that I wish that he had enough power to just “do”. But then there are enough things that I am glad the President (any President) does not have the power to just “do”. It is a system of balance, but because he cannot just “do” all the things that people want or expect him to do, he is condemned as a liar. This is just my view, but I think that our President has done his best to fulfill his promises, though opposition has stalled much of it. Give him credit that to be President is not just a simple, tell everyone what to do, kind of job. Just because he’s quiet about his faith doesn’t mean he doesn’t practice it. I just find the wording odd. I would think you care more about his relationship with God than his work, but may be just in this context you worded it like you did. Obviously a persons actions and words all represent the person and can’t really be separated. I’m not trying to be a jerk (although at times I’ve also been a jerk), it’s just that when I read that paragraph…a red flag jumped out in my mind (not really, but you know what I mean). On the blog itself, I completely agree that we should take Pres. Obama at his word. We are called to respect those in authority over us. I think the 1st step in respecting him would be to believe what he says about his personal faith. it’s not my intent to uber-compartmenalize stuff. i’m aware that for anyone, their “beliefs” would likely impact their values, decisions, and actions. but my relationship with president obama is such that his spiritual isn’t necessarily my primary accountability or interest. Thanks for the reply. And I’m jealous…you got the work “uber-compartmentalized” in your reply! Congrat’s on the 1 year anniversary of ODW…has it really already been 1 year? Crazy. Thanks for helping the poor. It’s encouraging for those of us on the front lines! If you need more projects, we could do with the funding!! BTW, I’ll be back in Washington for the month of December. Flying in and out of Seattle, not sure if there’s any chance to meet up, but if so let me know. Oh, and have you read the book ‘Love is an Orientation’? What are your thoughts? I don’t think the issue is actually Obama; in fact, I don’t think that if Obama announced he was joining a Franciscan monastery that it would change the kernel of doubt cast on him. I think the real issue here is the seemingly unfailing control of public perception that dominate the airwaves, rendering actual thinking, public civil discourse, and brotherhood null and void. It’s incredibly difficult to hold a political discussion with someone who has a different view. It is MUCH easier to invalidate and dehumanize the opposition by leading a disinformation campaign that paints broad-stroke perceptions that have little to no value to public discourse, because this type of distraction can more easily penetrate into the public sphere and keep actual issues from being understood. It’s “dog and pony shows” with names like “Glenn Beck” that encourage fear of the other and discourage true public discourse, all under the guise of “patriotism.” THAT, to me, is much scarier than a Cactus. a to the men, pastor cho! I really appreciate this dialogue. I appreciate Eugene addressing this issue. And I personally believe that President Obama is a believer and follower of Jesus. I believe his declarations of this. I personally agree with the statement my ‘The Chiz’ – unfailing control of public perception that dominate the airwaves, rendering actual thinking, public civil discourse, and brotherhood null and void. I also think that racism and ignorance play the biggest part why people feel the way they do. Few people want to admit that they are prejudiced and no one wants to admit that they are ignorant. Perception is reality, sometimes. Pres. Obama’s religion is of no concern to me. But, I believe him at his word. Who care what religion Obama is? I do not. All I see are pastors fornicating outside of marriage, and heads look the other way. Once they get to the pulpit, they bash Obama. He can call himself anything he likes. I think the judgement of the American people is interesting. Not that we are his judge, but we are watching. I don’t like the man, did not vote for the man, but I have been hopeful that he would govern with honesty and transparency. He has not. He does seem to love his wife and children, and I like that. I’m not his judge, but I don’t see anything more than political posturing. Nothing really that would tend to make me believe that he truly trusts in Jesus for salvation. I completely disagree. I think he has attempted to be much more honest and transparent than most other politicians I have seen in my lifetime. You see what you expect to see. You dislike him, disagree with his politics, and so you distrust him. This, I believe is why you probably cannot see his faith in the work he does, because I certainly do. Even when I disagree with his policies, I can still see the principles that guide him to those policies and they are Christian principles. Well, let’s see. He spent his entire life under the “ministry” of someone who proclaims Black Liberation Theology, which is “no Gospel at all”. His political idealogy is blatantly Marxist, and his record on abortion (which by the way for you lefties is technically murder of an unborn human baing, not merely the elimenation of “viable tissue”). He articualtes the Islam, like Bush II is opne of the great religions of the world. Other than that, I can see any reason to question his faith. Whether he’s a Christian or whether he’s a Muslim is two different questions. You have to be deluded to believe Obama’s a Muslim. But you’d also have to be a little naive to think that his Christian faith is important to his life. Although all that Rev. Jeremiah Wright stuff was foolishness, it did reveal that Obama had no idea what “his” pastor was saying on Sundays because he didn’t really go to church. And Obama didn’t want to have to admit during a presidential campaign that he doesn’t go to church and all the things he said about his faith was really a sham. I think Obama rolls his eyes before he puts on the “good Christian” face. But don’t we all do this, and does it really matter? Your cynicism is understandable given the hypocrisy that is revealed by many politicians. We have the ‘evidence’ of unrelenting media documentation to fuel our human assessments. Former Presidents Bush & Clinton both espoused Christian faith but they seemed to practice that differently. Certainly the SC Governor who staunchly railed against Pres Clinton’s ethics and Pres Obama’s policies based on a moral code is evaluated differently today vis a vis his faith by virtue of his admitted sexual affair. I know that we don’t truly know another person’s heart, that is God’s purview. What troubles me in my walk as a Christian is the increasing pressure to associate my every opinion of issues and the people who represent those ideas with the ‘truth’ about them based on reports of other people (men & women alike). It particularly troubles me that I’m told it’s my responsibility TO JUDGE so that the world may be safe and God’s service be furthered. I disagree with simple justifications and appreciate that Pastor Cho’s blog offers a place for those with varying opinions to reflect without feeling compelled to adopt to Eugene’s teaching on the issue in question. May God bless you all as you examine your own consciences and pray for God’s leading on choices re conduct and speech (in church and the voting booth). In the end, this is a personal conclusion I’ve drawn out of my own curiosity, but not something that I view as the central question of the Obama presidency. I would love our president to be a follower of Jesus but, like Eugene, I am more interested in the tangible results of Obama’s presidency and how it works for the good of the US and its people (of course, what even defines “good” for the country and its people is the central debate of politics and governance). George W Bush seemed to be a man of genuine faith, as did Jimmy Carter. On the other hand, Thomas Jefferson physically cut out all supernatural elements and miracles of Jesus from the Bible he read, and it is still unclear exactly what Lincoln believed (his wife held seances in the White House that he attended). The historical evidence seems fairly clear that success or failure as a US president, and doing good for the people being governed, is not necessarily correlated to or caused by the beliefs of that president. I wonder what the ACLU would think about the White House sending out this letter? You bring up a few good points about praying for and not necessarily agreeing with the President and though we need to pray for him, and really pray and not just say we do, this doesnt mean I have to agree with his “Christianity” No where in the sacred literature am I told to do that. I am told to be watchful and pray. He says He is a Christian but rarely upholds any values that the Scriptures teach us to exhibit. But hey, if he says he is then thats up to him. Blessings. So, what ‘values’ are you speaking of that he rarely upholds? Making a public scene about his prayer life? Paying homage to Corporate Muscle? Condemning all who do not see things his way? All I can say is that President Obama is fortunate that he doesn’t have to worry about your being his judge when that great day comes.